A Review A Day. Hopefully. I'm not a big fan of weekly comics, for reasons we've discussed before. 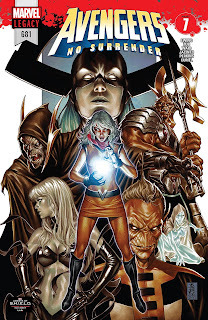 But the "No Surrender" series has - so far - been a success, as it combines stories about all the disparate Avengers teams working together against a world-class threat. The story works because it takes a classic villain - the Grandmaster - adds in a new Challenger to his title - and pits two separate teams of bad guys: the new version of the Lethal Legion, and the Black Order, a deadly crew of aliens who usually work for Thanos. The story could easily have been just a slugfest, but there are added layers of mystery adding to the fun, including the puzzling history of Valerie Vector, whose origin we see here. The art has been a bit uneven through the series (the biggest disadvantage to a weekly comic), but the story has been a blast so far, with a non-stop series of events designed to keep the reader - and the heroes - on their toes. The essays on this site are © 2008, 2009, 2010, 2011, 2012, 2013, 2014, 2015, 2016, 2017, 2018, 2019 the respective writers.